‘ With every book I am pushing the line, thinking how much can I get away with’, said Ranjit Lal, an author who addresses even the not so pleasant topics in Children’s literature. Th session ‘Writing for Children’ saw two of our favourite authors on that genre having a cordial and warm discussion on the Children’s literature. Reena Puri and Ranjit Lal argued for traditional themes vs the contemporary themes in Children’s literature. The session seemed almost like storytelling episode. Their well-modulated voices and hand gestures might have reminded more than a few in the audience of their favourite English teachers. 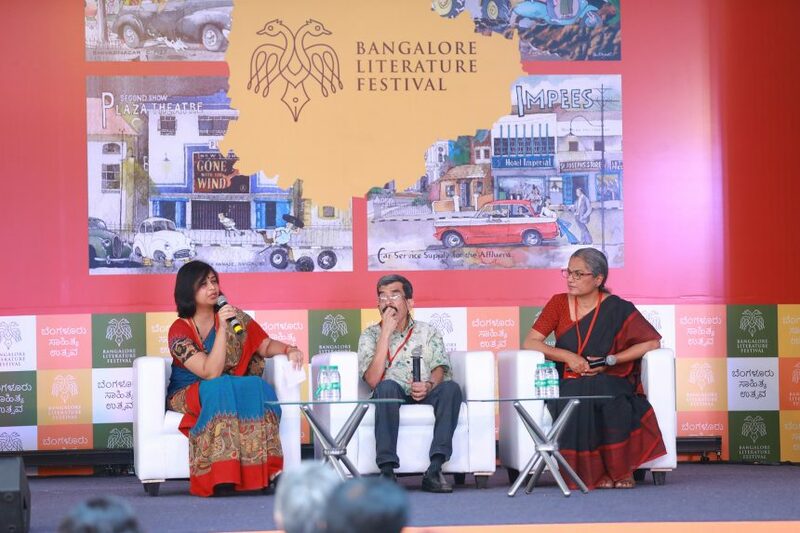 Sudeshna Shome was the moderator of the session. She knew how to ask the questions that can elicit replies that might long live for the session. To all of you who thinks Children’s literature is not significant enough to discuss, let me remind you of the vocabulary, the morals, the adventure and imagination that only a book can give to a child. I will also add patience to the list as I have seen my little brother sit still only when he had a Balbhumi during his toddler days. Ranjit Lal whose books are based on contemporary themes confessed how he can’t write on traditional themes as it is a field that he has zero knowledge on. Everyday concern and evils that children need to be educated on are taken up by Ranjit Lal. For instance, one of his books deals with grandchildren learning to cope up with their Grandfather’s amnesia. His books are also noted for the female/ girl centrism. In his book, it is always the girl who guides the boy. He admitted in the session with a grin that it might be the result of growing up between two sisters. Reena Puri, editor of Amar Chitra Katha emphasised on traditional themes in Children’s literature. She spoke how myth and tradition are used to educate the children on their rich culture. Reena Puri also spoke of their collective attempts to tailor myths and tradition to the present needs in Children’s literature. The westernisation that has happened even in Children’s literature was something both the authors agreed on. Ranjit Lal recounted an incident when he was asked to judge a children’s short story competition. He found to his dismay that all their characters had names like Jack or Jill. The session also saw Ranjit Lal explaining the absence of parent or adult figures in his stories. They interfere too much. I put them in a hospital or something, he replied to the audience and I am charmed.